Preheat to 350°F or 175°C. This step is optional but if you want softer raisins I would advise it. Mix all your liquid ingredients (minus the egg) and let it soak for 20-60 minutes. You can go overnight but they get really soft and I dislike that. I did mine for only 10 minutes and that was good for me. 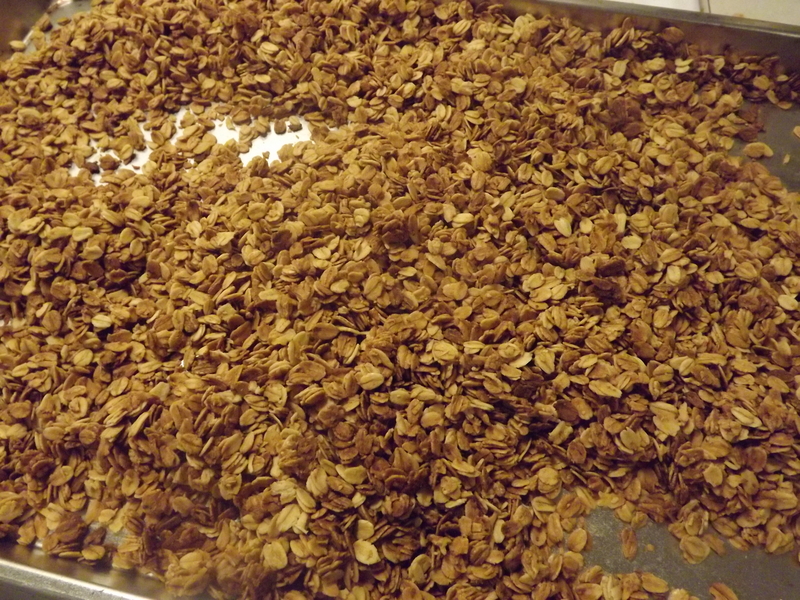 Next mix all your dry ingredients in your bowl and then add your raisin mixture and egg. Use a spatula to mix (or a spoon) thoroughly. It is a thicker batter so don't be alarmed. Line your cookie tray with parchment paper or a silicone baking mat. 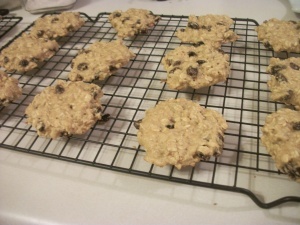 Spoon out a rounded tablespoon per cookie and squish them down. These cookies will rise slightly but will not spread outward. I suggest no more than 12 per tray. 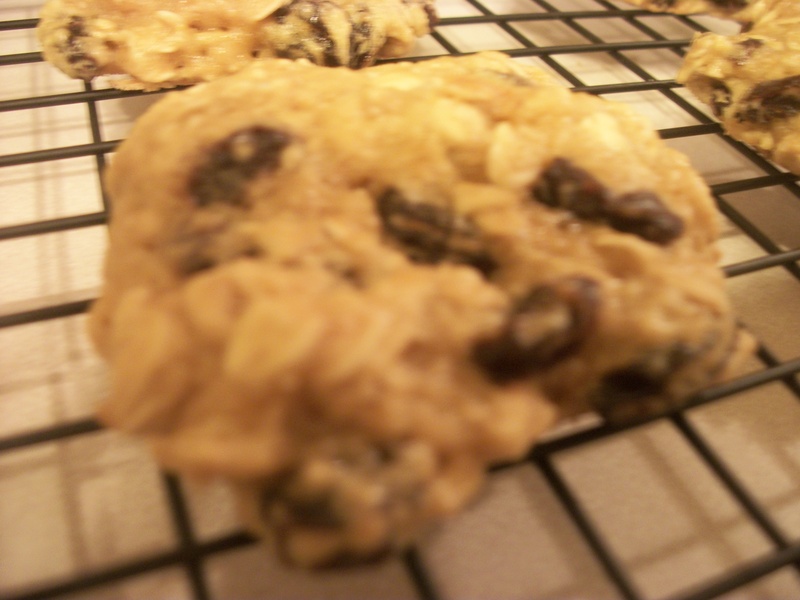 Bake these cookies for 12 minutes and move to a wire rack to cool. They get chewier as they cool. 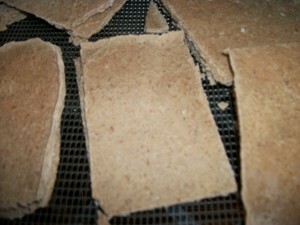 * : You can use all whole wheat flour or all all purpose flour it's a person preference. Whole wheat flour will make the cookies more dense. I would do no more than ½ and ½ but that is me. ** : You can use all sugar or you can skip the sugar and just use maple syrup (or honey). Brown sugar would be best but I used evaporated cane sugar and molasses. 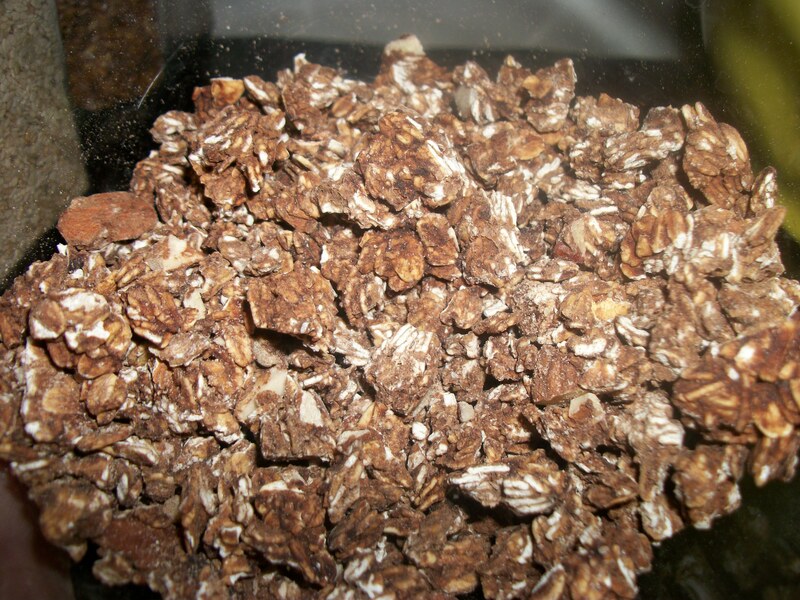 *** : You can substitute raisins for any dried fruit to mix this up. Try blueberries and craisins, Delicious! 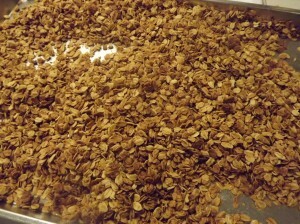 In a large bowl add in everything except the oats. Mix well. 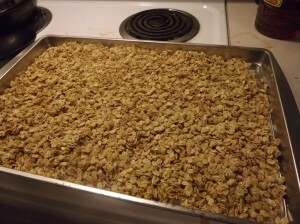 Add your oats 1 cup at a time and stir well. 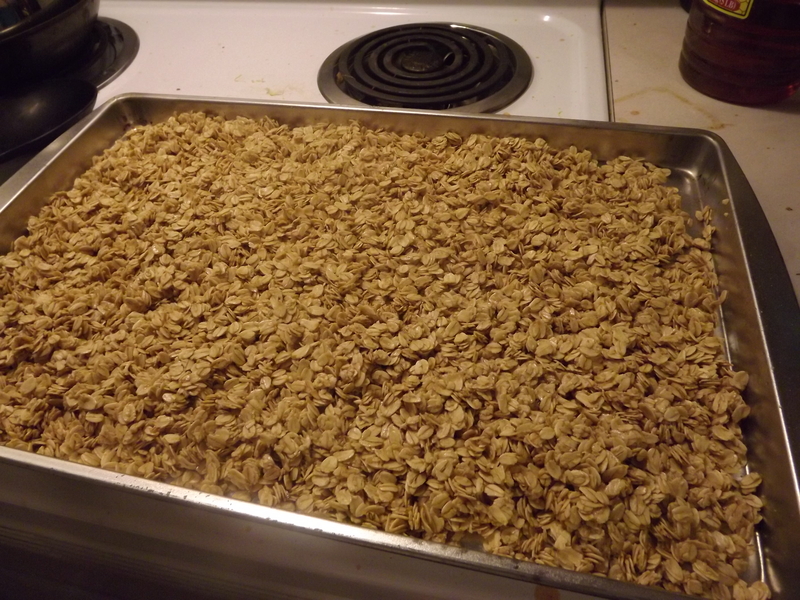 (don’t be afraid to use your hands, it really works best) After you have all your oats mixed in, let it sit for a couple minutes. 2-5 minutes is a long enough, very easy to do while your oven preheats. 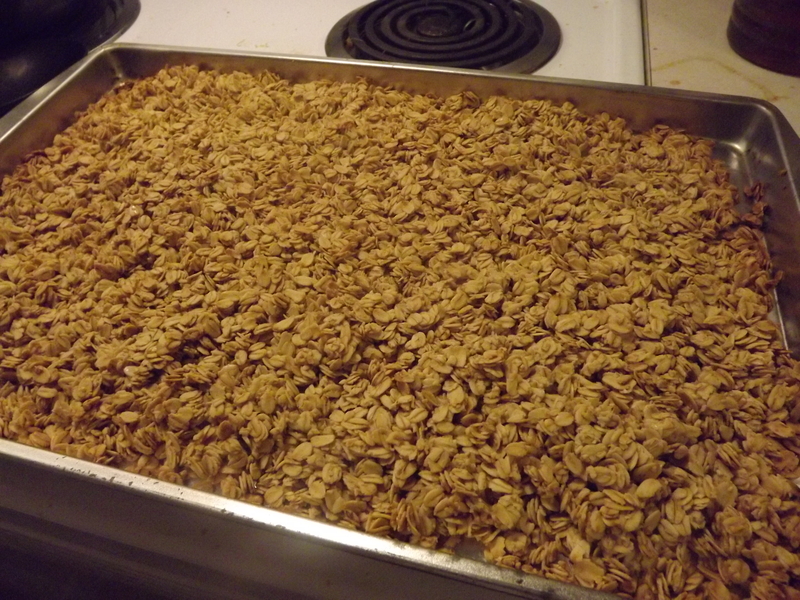 Once your oven is preheated, take a full sheet pan and evenly spread your oat mixture on it. Pop it in the oven for 15 minutes. 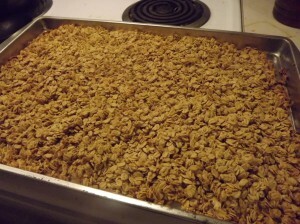 After 15 minutes take the pan out of the oven and stir/flip the oats with a flat spatula. Put it back in the oven for 15 more minutes. 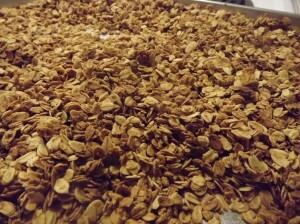 (Above photo is granola mix after 15 minutes in the oven)Take the granola out of the oven again and stir. Depending on your personal taste you can stop now. If you want it darker, continue cooking in 5 minute intervuls instead you reach your desired doneness. **Can be gluten-free if you make sure you purchase gluten free oats! ***vegan friendly if you it without honey, maple syrup instead. 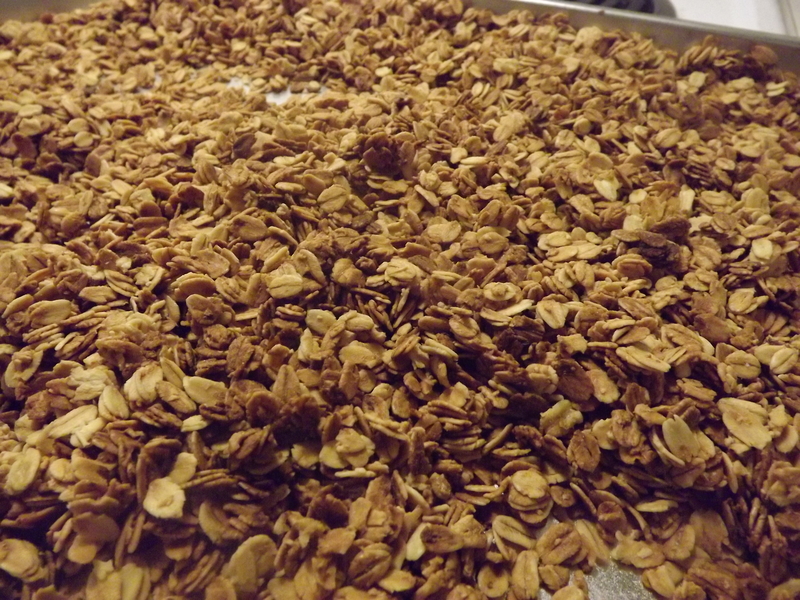 I hope you will try this easy granola and let me know in the comments what YOU would put with it. Me personally, I enjoy my granola with some unsweetened almond milk or on-top of organic Greek yogurt with fresh seasonal fruits, yum yum!